The sunshine made an appearance this weekend and you can almost believe Summer is around the corner. The weather mixed with ELLE's SS15 Collection has got me looking to the future and already summer wardrobe planning. These are the collections which have me on tenterhooks for June! Burberry always has the most gorgeous palate of colour with the pastel tones and ombre shades. The amount of tule used is dreamy and oh so feminine. I love the original tailored shapes of these dresses, but the layering of tule, bows and prints adds pixie-like play-fullness. The contrasting trainers are a nod to the sport luxe trend which makes me very happy. Armani really likes his shades of blues, whites, greys and metallics. If you look in my wardrobe I have the same amount of colour, so these pieces will fit in seamlessly. In particular, I love the city shorts, nautical stripes and pheasant shirts. This collection looks like it's stepped out of a Midsummer Night's Dream. I adore how dark and dramatic this collection is, with intricate botanical embroidery and high Victorian collars. Personally, my favourite piece is the more minimal black strapless cut out gown. Givenchy found the perfect balance and blend of edginess and romance in this collection, There's a hint of promiscuous with the low V necks, short hem lines, leather trousers and thigh-high boots but the craftsmanship, lace and pleats distracts from that. Give me the narrow shouldered jackets any day! You can sum this show up in one word - utility. I like the understated, clean lines and finishes - there's no fussiness to distract you from the quality and practicality of the clothes. 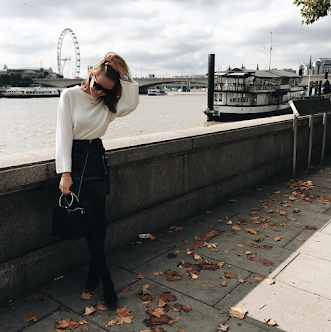 The high street has already embraced it with khaki, belts and D-loops in nearly every store. Despite the masculinity in utility, Jacob's has managed to add femininity with puff ball skirts. 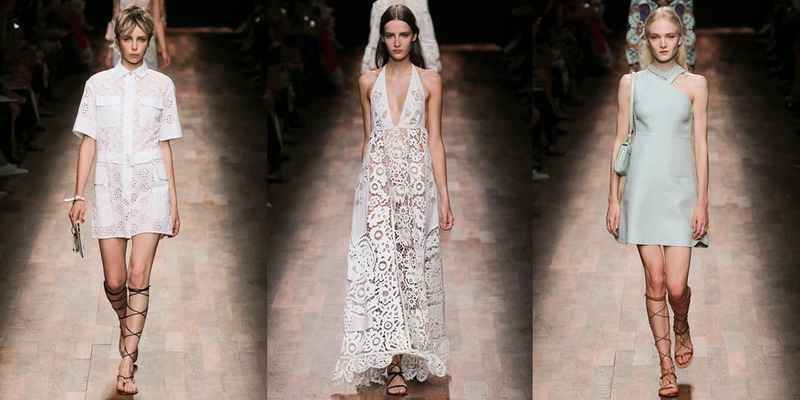 Valentino never disappoints with it's romance - it has me dreaming of holidays in Santorini. Based on the 18th century tours of Italy, it is just simply beautiful. 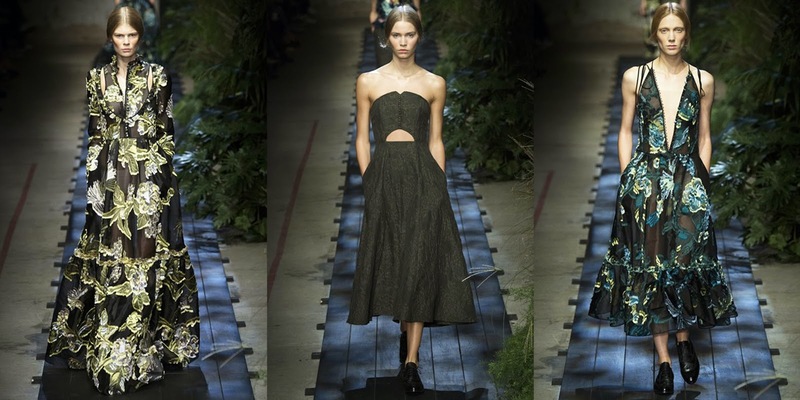 This collection can take you from day to night, with backless pinafores and knee high sandals, to embroidered floor length evening gowns - I could spend all Summer in Valentino (I wish!). Who's got you excited for Summer?